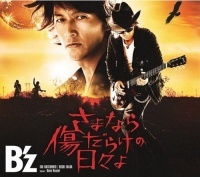 Sayonara Kizu Darake no Hibi yo (さよなら傷だらけの日々よ, Goodbye Painful Days) is the forty-eighth single by B'z, released on April 13, 2011. It is the first single to be released after the band had wrapped up their respective solo projects from the previous year. Originally, the single was scheduled to be released on March 30, 2011, but due to the magnitude 9.0 earthquake that hit northern Japan shortly before, the single was delayed as a result of production difficulties. At release, the song debuted at #1 on the Weekly Oricon Singles chart and became the forty-fourth consecutive single for the band to do so. The titular track from the single would go on to be included on the band's next album, C'mon, and would also be used to open the LIVE-GYM of the same name. Later, in 2013, the single would be collected on a B'z compilation for the first time with the release of B'z The Best XXV 1999-2012. The song, which was tied in to a Pepsi NEX commercial, was the first B'z song to be solely composed for a commercial. Tak said in an interview that he looked over the storyboard for the commercial to get an impression of what he felt the song should ultimately sound like. The resulting advertisement was the first time in which B'z had appeared in a commercial. The commercial and music video were filmed simultaneously at California's Inyokern Airport in January 2011. The music video was made available in the limited edition version of the single on a bonus DVD, and was also made available on the band's official YouTube page. B'z performed the song on television for the three-hour special of Music Station that broadcast on April 1, 2011. After the performance, the band followed up with a rendition of "Brotherhood" in order to provide support for those that had been affected by the disaster. In 2012, the limited edition package for the band's fiftieth single, "GO FOR IT, BABY -Kioku no Sanmyaku-", included a performance of "Sayonara Kizu Darake no Hibi yo" from the special Pepsi NEX presents B'z 1DAY LIVE event the previous year. With Pepsi's new ad slogan "GO NEXT!" in mind, "Sayonara Kizu Darake no Hibi yo" is a hard rock song about leaving an old life behind to begin a new one. It also marked the very first occasion in which B'z wrote a song specifically for a commercial. Koshi said that "with 'GO NEXT' in mind, I think I was able to successfully link its intended meaning to the lyrics". Tak added that he made the song with a sense of speed and refreshment in mind. When it came time to arrange the song, Tak said it was at first difficult to balance the heavy sound with the overall song. It was performed once on television and was used to open B'z LIVE-GYM 2011 -C'mon- and later appeared during the band's 2017 activities. Originally entitled "The Runner", "Dawn Runner" is an outtake from the ACTION sessions. For the version found here, most of the song was re-recorded. The title was changed late in the process, with Koshi stating he had always wanted to change it. Due to how busy the recording sessions for C'mon were at the time, Tak did not know about the re-title until he saw the provisional packaging art for the single. Ultimately, "Dawn Runner" was chosen for inclusion by the band in order to create a well-balanced single. The lyrics of the song are centered around morning running. Interestingly, the song opens with the protagonist stating he wakes at 3:00 AM and sets out to run, though Koshi clarified he does not usually wake up so early to begin his customary workouts. The song was influenced, however, by a time he had awoken early due to jet lag and ran along the empty streets. He also added that the song is a good fit for listening to while marathoning. This page was last modified on 3 June 2018, at 21:27.